Close to where I am currently staying, there is a hotel with an interesting item in its menu – ‘Fried Ice Cream’. For some days I was trying to taste this one. 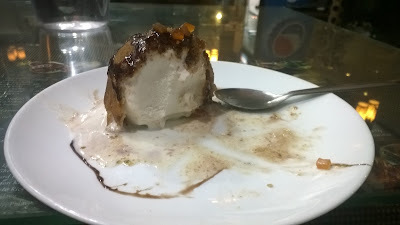 After all, who don’t want to taste fried ice cream? Till know either I forgot to buy it when I am close to that restaurant or reached there after 7 ‘o’ clock. This item is available in between 4pm – 7pm only. Fortunately, I remembered it today and went there at 6.30pm and ordered one. I tried to pull Rakesh too; however, he was not in a mood to wake up after playing a cricket match in the morning. I ordered and within ten minutes it reached my table. Hmm…it was brown in colour and looked more like a bigger egg with chocolate cream sprayed over it. Numerous yellow and green coloured tutty fruity squares where there in the plate. 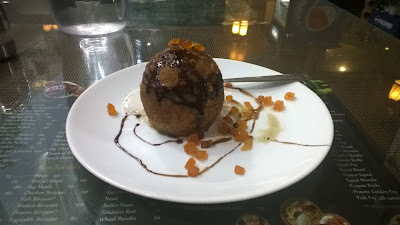 I think they just took a sphere of vanilla ice cream, immersed in liquid gram flour. Then…. Fried it a bit. I missed to ask how they prepared it. If it was hot then this would have been tastier. 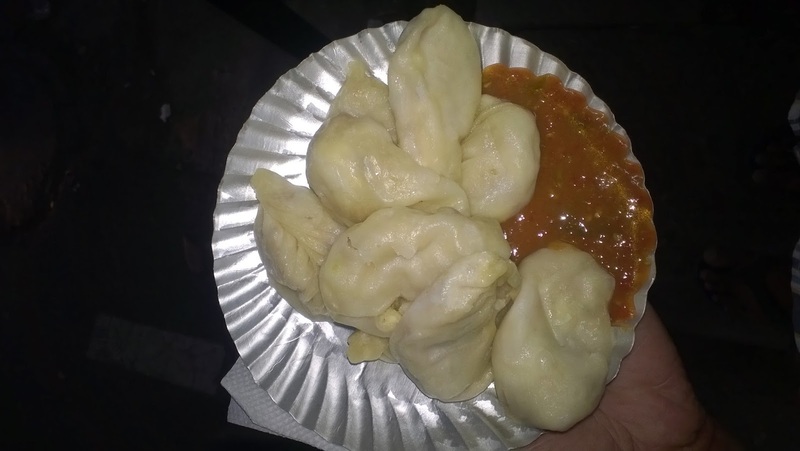 After that, I went outside to have some pazham pori, mulaku bajji, veg cutlet, ada, aaloo bonda etc. However, the crowd in front of that store was too big; hence I moved towards a nearby momo shop and had a good plate of spicy Paneer Momos. Nice snacks for a Sunday afternoon.